Pour 2 cups of boiling water in a heat safe bowl. Add the grape gelatin. Whisk until gelatin is fully dissolved (about 2 minutes). Stir in 2 cups of rum. Divide the mixture equally in two bowls. To one, add 6 tablespoons of the coconut milk. Stir well. Add a little of the pearl dust to the transparent gelatin, if desired. Set both bowls aside. Pour 1 cup of boiling water in a heat safe bowl. Add the blue gelatin. Whisk until gelatin is fully dissolved (about 2 minutes). Stir in 1 cup of rum. Divide the mixture equally in two bowls. To one, add 3 tablespoons of the coconut milk. Stir well. Add a little of the pearl dust to the transparent gelatin, if desired. Set both bowls aside. Pour 1 cup of boiling water into a heat safe bowl. Add the gelatin and stir until dissolved (about 5 minutes - microwave for a few seconds if difficulty dissolving). Add the sweetened condensed milk and a few drops of the pink food coloring. Stir well. Stir in the rum. Set bowl aside. 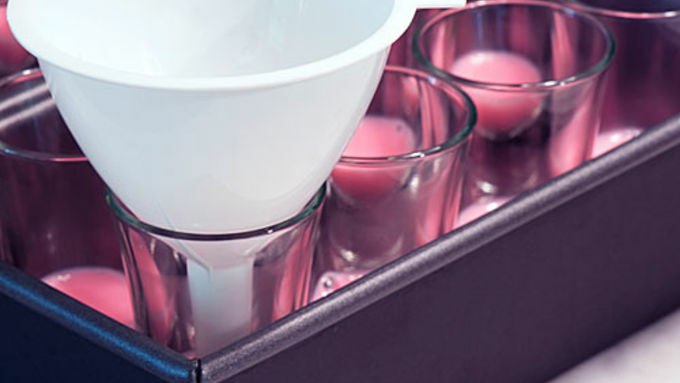 Begin layering the gelatin, beginning with the pink, by pouring 1 1/2 teaspoons into each shot glass. Place shot glasses in the refrigerator until layer is set, 20 minutes or so for the first layers. Setting time will decrease as more layers are added to the glasses. Repeat step 5, layering with the purple, purple opaque, blue, blue opaque, purple, purple opaque, and finally another pink layer. 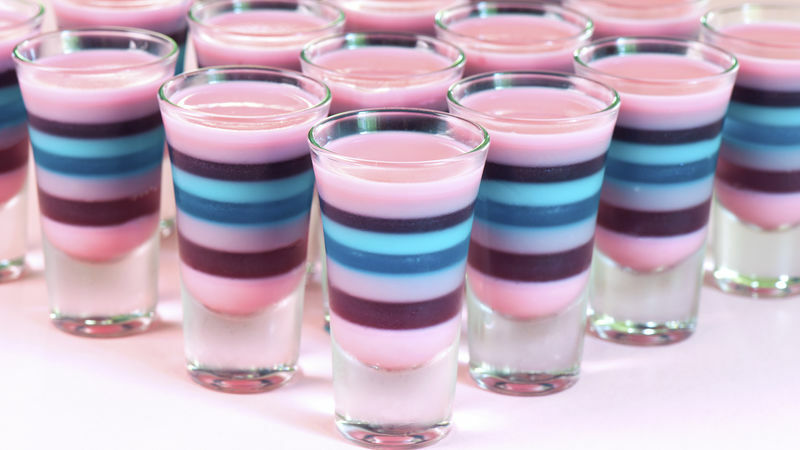 I wanted to bring a special jelly shot to a friend's birthday party. Something with that sort of super-cute aesthetic appeal would be fun. I envisioned a multi-colored, molded unicorn jelly shot - perhaps with a horn fashioned from pastel licorice. 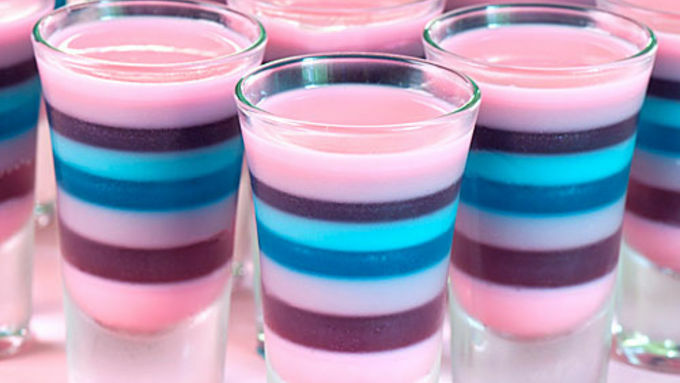 So, you must be wondering why there are no photos of unicorn-shaped jelly shots in this post. Well, things do not always run like a Swiss train at the Jelly Shot Test Kitchen. The night before the party, I made the jelly shots, in adorable horse molds. The next morning, I unmolded the jelly shots, or rather, I should say attempted to. The loosening, and hot water bath method wasn’t working with the plastic molds. The resulting unicorns were looking a bit careworn to say the least, i.e. many were missing ears, limbs or random chunks of jelly flesh. I clearly needed a Plan B. With a few twists, I came up with the Sparkle Magic Jelly Shot. The most efficient route was a layered rum and flavored gelatin-based jelly shot. I used coconut rum, with coconut milk added to the opaque layers (vanilla yogurt works well too). A little edible pearl dust added to the transparent layers added some birthday sparkle. It all worked out wonderfully. Using the shot glasses meant that the setting time for each layer was very short, and the jelly shots were completely set by party time! Crisis averted! A few tips: I find it easier to make all the layers at once, at the beginning of the process. If the gelatin sets up, just microwave for 20 to 30 seconds and it will become pourable again. Placing the shot glasses in loaf pans makes for easy transfer of the shot glasses in and out of the fridge. A funnel also works well for making uniform layers (and not spilling on the sides of the shot glasses)! Hope Sparkle Magic Jelly Shots bring a bit of nostalgic fun to your next celebration!